With the advent of airline ‘alliances’, you can pretty much mix and match flight connections without expecting to pay more than a direct flight, but if you absolutely detest the idea of hopping from one plane to the other, several airlines have non-stop, daily services to and from North America, Europe and Asia Pacific. 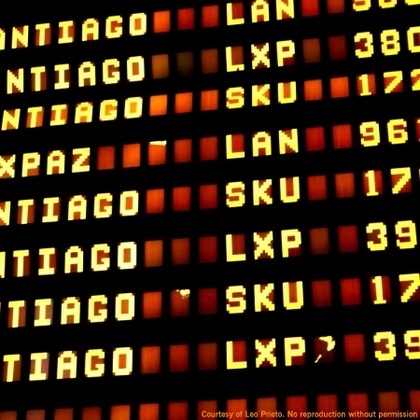 All major cities in South America have non-stop flights to Santiago. From Europe: Air France flies non-stop, five times a week between Paris and Santiago. Iberia, LAN Airlines and the low-cost carrier Air Comet all have non-stop services to and from Madrid. Swiss Airlines flies to and from Zurich, all the way through with a short transit in Sao Paulo. From Asia Pacific: LAN Airlines has six services a week to and from Auckland, with continuing flights to Sydney and two weekly flights to and from Easter Island with a final leg to Papeete. From North America: American Airlines and LAN Airlines have non-stop services to and from Miami and Dallas. Delta Airlines has direct flights to Atlanta. LAN Airlines flies to Los Angeles and New York with transit in Lima or Miami. LAN Airlines and AeroMexico fly non-stop to Mexico City and Cancun daily. Air Canada flies to and from Toronto several times a week. All flights arrive at Santiago’s International Airport, Arturo Merino Benitez, which lies at around 30 minutes from the city’s centre. You can catch an hourly bus service to and from just outside Los Héroes Metro station. A taxi journey between the city and the airport costs between 9,000 CLP and 15,000 CLP. There are several international coach lines that offer services to Buenos Aires, Mendoza and Bariloche in Argentina.